This video comes with Hebridean wind quality. The frozen laver came from these rocks some weeks ago. Laver freezes as hard as a rock, unlike some other species of seaweed. I took the frozen laver balls down to the beach and filled my pressure cooker pan (which incidentally cooks kelp stipes superbly) with seawater. I popped the frozen laver balls into the seawater and waited .... the August seawater was cold. The west coast of the Outer Hebrides is lined with white shell sand. Beaches vary in size and beyond the sand dunes of my local beach on the Isle of South Uist, is the machair. In summer it grows flowers rather than grass. In the winter months cattle and sheep graze the machair and in warmer months, it provides useful arable land for crofters. Crops are planted on allotment sized, strips of sand-rich soil. Potatoes grown on the machair, rival those from Jersey, the other potato that is fertilised by seaweed. Jersey potatoes are renowned. Machair potatoes remain a Hebridean secret. 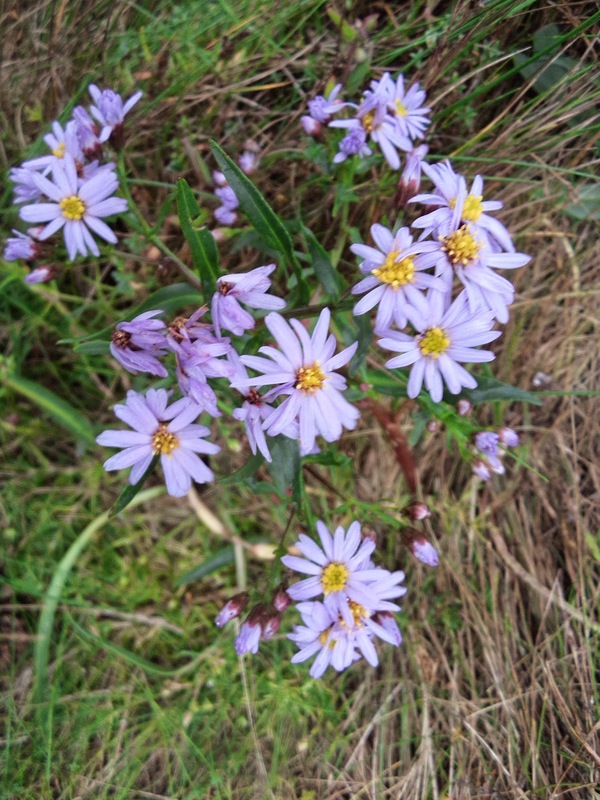 Further down the coast towards North Uist, I can pick the sea-sprayed leaves of a tiny, mauve flower called sea aster. Cooked, the leaves retain colour and raw, they are delicious in salads. Sea aster flowers are edible too. You may find glasswort (marsh samphire) close by. Glasswort has green cactus-like leaves and is best picked in June and early July, before it becomes woody. Equipped with scissors, foraging glasswort may be a backbreaking experience but its taste is worth the back pain. Personal hardship aside, like other wild ingredients, it is free. On tidal beaches, the shellfish seeker may find cockles or with luck, razor clams. It's a tide dependent thing. A long walk is part of the exercise and local knowledge, useful. There is an art to grabbing a razor clam. It escapes by using its well-designed foot, which it uses to scoot at speed through the sand. A word of caution comes with the name; razors can mess up fingers and hands. The local Island GP has sutured the fingers of razor clam hunters. Some foragers swear by salt, which they sprinkle over the tell tale keyholes, which the clams leave in the sand. A kind Islander once told me, to await the turning tide before grabbing the razors or spoots, as they are known as in Scotland. This is because razor clams come up to sunbathe, as the tide returns. No digging, no sprinkling of salt (use a jam jar, cardboard cartons become soggy and damp salt will clog-up plastic nozzles); once spied, quickly but firmly, grab your razor clam. I've added a can of tuna fish in this easy recipe because I know that foraging enough razor clams to lunch upon, is a matter of experience. If you find a quantity to dine royalty, forget the tin of tuna in this Seashore Salad. When foraging wild ingredients, take enough for your own need and no more. Most floral vinegar recipes suggest leaving the flowers for 10 -14 days before straining the vinegar. Sea aster flowers will add a light scent. Simply put the flowers into a small jar and fill the jar with white wine or rice vinegar. Cover with a vinegar proof lid and place on a sunny windowsill until it has reached the desired flavour. Steam the potatoes for 12-15 minutes until just cooked but still firm to the bite. Put the razor clams on to a baking tray. Cook under a very hot grill briefly (1 minute) until the shells open. When they are cool enough to handle remove the white meat. Trim off the intestines. Return the clams to the grill for about 45 seconds until they begin to steam. Do not overcook or they will toughen. Quarter each clam. Cut the cooked potatoes into bite sized pieces and put them into a warm serving dish. 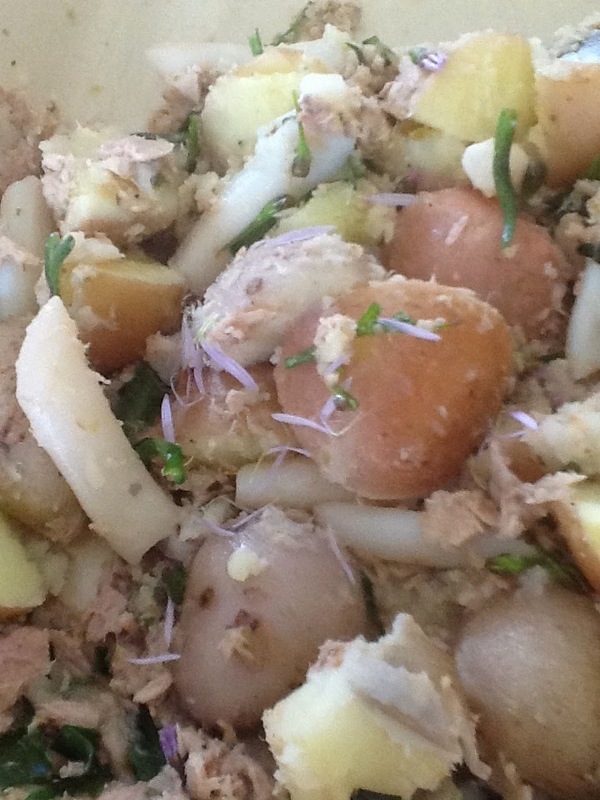 Add the drained tuna fish, razor claims, sea aster leaves and buds. Mix the sea aster vinegar and oil together and add to the salad. Toss ingredients well and season with freshly ground pepper. Scatter the sea aster petals over the salad and serve immediately. A perigee moon appears bigger and brighter because the moon has reached the point in its orbit when it is closest to the earth. The days following a super moon bring the lowest of spring tides. This evening's perigee moon will be HUGE . 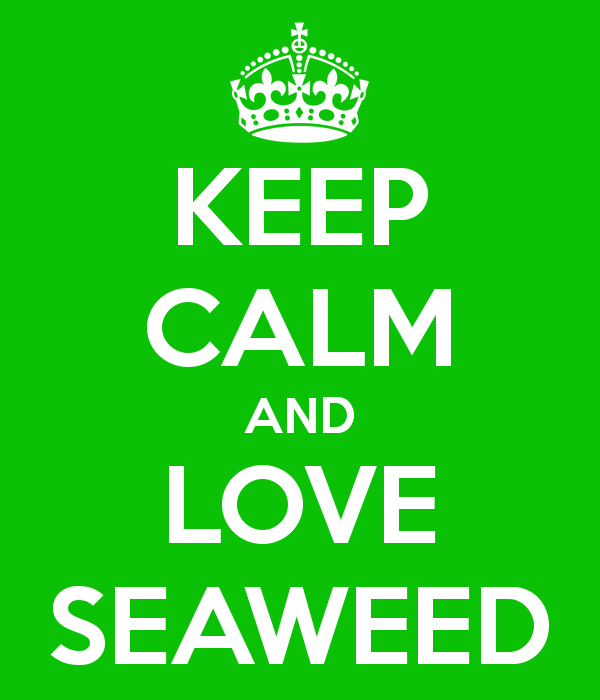 Monday August 11th and Tuesday, August 12th will bring amazing low tides which will reveal seaweed, shellfish and much more on the ocean's bed. 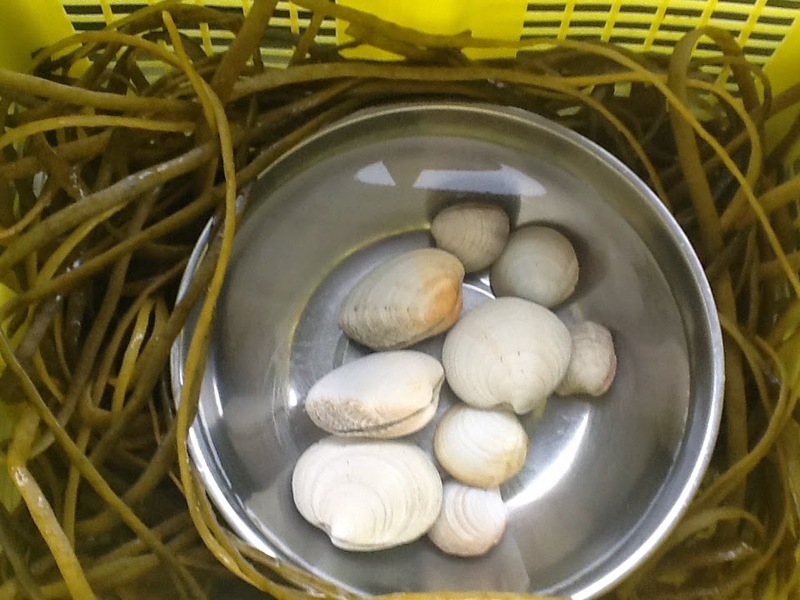 Check the time of low tide at a beach near you and go coastal foraging. Remember that the tide dictates the schedule not the forager. Here is supper which we found at low tide today. The well washed sea spaghetti, needs to be cut into manageable lengths and will turn green when placed in a pan of boiling water. It will take 15-20 minutes to cook. Drain it well and reserve the cooking liquid. It makes a delicious, versatile stock. I often use seaweed stock when I poach chicken. The palourdes will self clean as they soak in a bowl of cold water. Steam the clams or cook them in a shallow pan with minimal water. Discard any that don't open and remove the clams as they open because they have a tendency to go rubbery, if overcooked. Toss the cooked sea spaghetti and palourdes into a sauce of your choice - simple garlic butter mixed with creme fraiche is ideal. 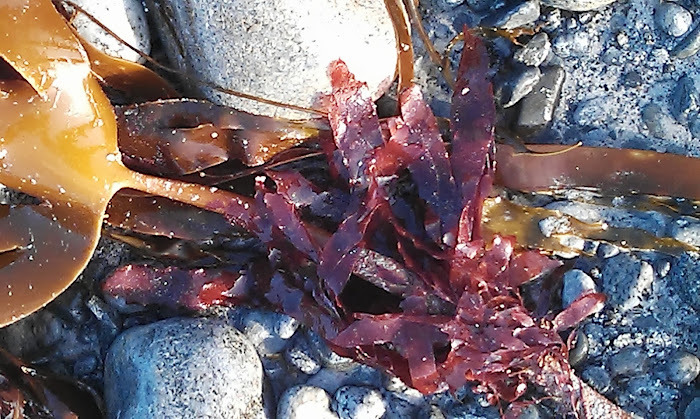 The Huffington Post has an Outer Hebridean seaweed post featured as its most read food post. Seaweed rocks.